The natures generator is comprised of 2-natural ways to generate free electricity. The first is through the included solar panel(s) and the second is through the wind generator port, wind generators can be purchased separately. The system consists of a battery pack that stores electrical energy, state-of-the-art electronics that convert 12-Volt to normal, everyday household electricity. In addition the natures generator does not require any gas to run and also does emit any toxic fumes like standard gas generators can, not to mention it does not produce any sound. With the included solar panel(s), the natures generator is a complete solar electric production and storage unit. Generators are self contained power which generate their own electricity by use of a solar panel or wind generator. It generates its own electricity and stores the electricity for use when you need it. The platinum system includes the nature's generator, natures power pod, three 100-Watt solar panels and cart, universal heavy duty cart, app access and a 1 year warranty. 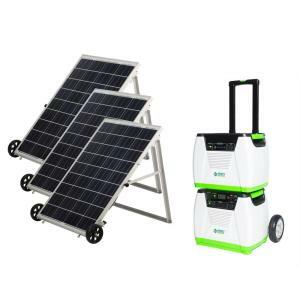 Tbook.com crawls the web to find the best prices and availability on Generators and related Tools and Hardware products like 1800-Watt Solar Powered Portable Generator with Electric Start. For this page, related items include products we find that match the following keywords: "Generator GENERATOR" at our vendor partner Home Depot. 1800-Watt Solar Powered Portable Generator with Electric Start is one of 152 Generators and related products listed in the Tools and Hardware section of Tbook.com If you have any questions on this product, please give us a call at 734-971-1210 during the hours of 9am - 5pm EST for assistance. Thank you for shopping at Tbook.com, the Internet Department Store!